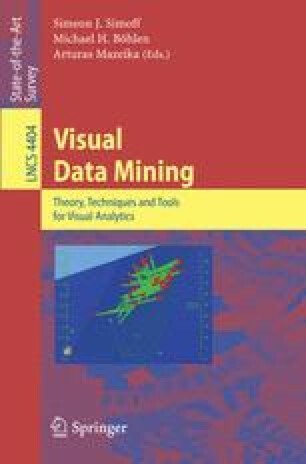 A software system has been developed for the study of static and dynamic data visualization in the context of Visual Data Mining in Virtual Reality. We use a specific data set to illustrate how the visualization tools of the 3D Visual Data Mining (3DVDM) system can assist in detecting potentially interesting non-linear data relationships that are hard to discover using traditional statistical methods of analysis. These detected data structures can form a basis for specification of further explanatory statistical analysis. The visualization tools are shown to reveal many interesting patterns and in particular the dynamic data visualization appears to have a very promising potential. To further explore the human faculties, sound has also been used to represent statistical data. Current technology enables us to create advanced real-time 3D soundscapes which may prove useful since the human ears’ field of hearing is larger than the eyes’ field of view, and thus is able to inform us on events happening in areas that we cannot see. The audio-visual tools in the 3DVDM system are tested and the effectiveness of them is discussed for situations where sound acts as support for visual exploration, as well as use of sound as a sole cue for analyzing data in VR.